Today we have another guest post on Eruptions, this time by Morgan Salisbury, a Ph.D. candidate at Oregon State University. He will be taking you to look at some of the volcanism in the Central Andes of South America. Enjoy! The central Andes of South America is an exciting place to study volcanology. The continental crust in the here is thicker than almost anywhere else on earth and certainly the thickest with abundant volcanism. 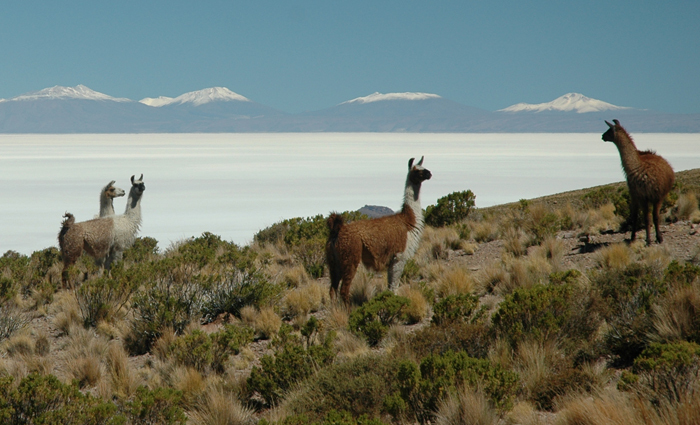 The vast Altiplano-Puna plateau that comprises the central Andes is second in height and width only to the Tibetan Plateau, the latter of which formed by the collision of two continental plates. In contrast, the Altiplano-Puna plateau was constructed at the boundary of the oceanic Nazca plate and the continental South American Plate, an arrangement that generally does not produce thickened crust and large plateaus. Because of crystallization and assimilation with the thick, low-density crust of the Altiplano-Puna, mantle-derived magmas are inevitably significantly altered the time they erupt on the surface of the plateau. The contamination makes it very difficult to determine why the mantle melted in the first place, particularly in the eastern regions of the plateau, well behind the more obviously subduction-related volcanoes of the arc front. Unaltered lavas that all volcanologists to determine the mechanisms of mantle melting are virtually non-existent in the Altiplano-Puna. But this is why I think studying these volcanoes is so interesting, we are trying to figure out the root cause of their existence, which remains a matter of debate. It’s a relief to know that such simple questions remain unanswered in this day and age. 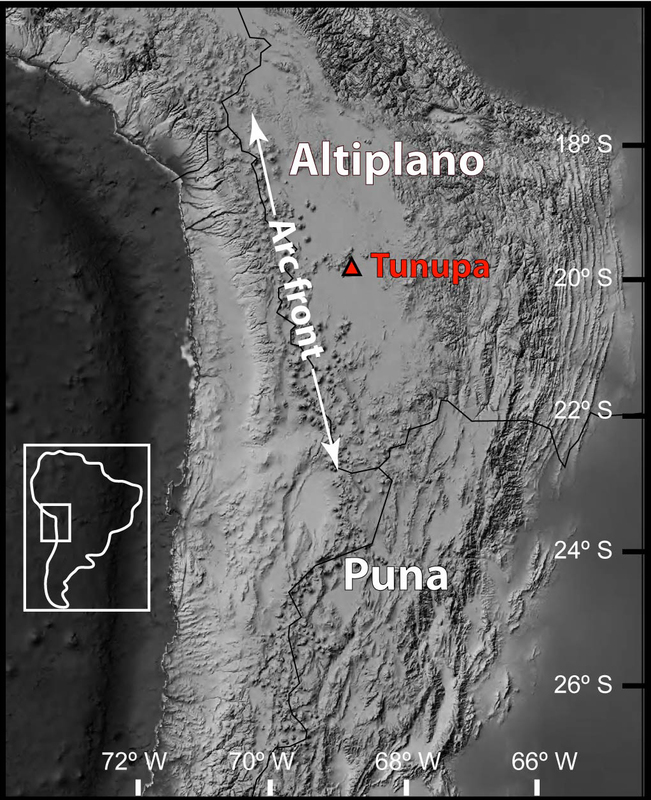 Location map of Altiplano-Puna plateau of the central Andes. Volcán Tunupa is a composite cone located east of the arc front near the center of the Altiplano basin in Bolivia. Click here to see larger version. Subduction zone volcanism has persisted along the western edge of South America for at least 200 million years but only since about 25 million years ago did volcanoes start appearing in abundance east of the arc front in what is now the interior of Bolivia. The shift from focused to widespread volcanism is undoubtedly related to growth of the Altiplano-Puna plateau, but the exact process remains unknown. One of the more interesting hypotheses is that the behind arc (east of the arc front) volcanism is due to lithospheric detachment, often referred to as delamination, or foundering. In this scenario, crust and the underlying lithospheric mantle that has been pushed deep into the earth by the mountain building process becomes denser than the asthenospheric mantle, detaches, and then sinks. Magma can then be generated by decompression melting as the asthenosphere ascends to fill in the space of the detached lithosphere. Although there is supporting evidence for lithospheric detachment form geophysical data, the process remains unproven. Alternatively, arc volcanism may either be particularly diffuse in this region, or complex asthenospheric convection may be responsible for the widespread volcanism in the continental interior. Volcán Tunupa from the north. The town of Salinas de García Mendoza is in the foreground. Click here to see a larger version. I think that volcanology has a lot to the debate, with the first step being to obtain radiometric ages and chemical composition for lavas from the behind arc volcanoes. Knowing the timing, location, and geochemistry of volcanism will help reveal the process that resulted in the likely related processes of mantle melting and plateau formation. As part of my PhD at Oregon State University I looked into the chronology and chemistry of lavas that constructed the behind arc Tunupa volcano, which is located on the Bolivian Altiplano between the giant salt flats known as the Salar de Uyuni and the Salar de Coipasa. With help from my collaborators, I found that the volcano was constructed about 1.5 million years ago, younger than previous age determinations had suggested. The lavas also have unusual chemistry that differs from the volcanoes of the arc front. Although it is difficult to tell exactly what caused the mantle to melt beneath Volcán Tunupa, the results from the study do seem to point to complicated processes that could fall in line with the lithospheric detachment hypothesis. There are other possibilities of course, but it is a very exciting time to work in this region. There are many volcanoes left to explore and many problems that remain to be solved. View from Tunupa looking south towards the Salar de Uyuni and snow-capped volcanoes in the background. Click here to see a larger version.